In a microwave-safe cup, heat the milk until warm but not hot, about 20 seconds. Add the yeast and sugar and let stand until foamy, about 5 minutes. Scrape the mixture into the bowl of a standing electric mixer fitted with the dough hook. Add the egg and 6 tablespoons of the melted butter and beat at low speed just until combined. Add the 3 1/2 cups of flour and the salt and beat at low speed until the dough is evenly moistened, about 2 minutes. Increase the speed to medium and knead until a soft, smooth dough forms, about 10 minutes. Transfer the dough to a floured work surface and pat it into a 10-inch square. Fold one-third of the dough into the center and the other third on top, like folding a letter. Turn the dough and fold again; you should have a small square. Butter the bowl and return the dough to it. Cover with plastic wrap and let stand in a warm place until doubled in bulk, about 1 hour. Butter a 9-by-13-inch baking pan. On a well-floured work surface, roll out the dough to a 15-inch square. Working from the bottom, tightly roll the dough into a log. Using a floured knife, cut the log into thirds. Cut each third into 5 slices. Arrange the rolls spiral side up in the baking pan in 3 rows of 5. Cover loosely with buttered plastic wrap and let rise for about 1 hour, until billowy. Preheat the oven to 375°. Remove the plastic wrap and bake the rolls for 15 minutes. 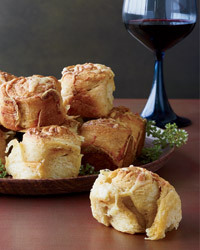 Sprinkle the cheddar cheese on top and bake for 15 minutes longer, until golden and cooked through; cover the rolls with foil for the last 5 minutes to prevent over-browning. Brush the rolls with the remaining 2 tablespoons of melted butter and sprinkle them with the Old Bay seasoning. Transfer the baking pan to a rack to let the rolls cool before serving. MAKE AHEAD The baked rolls can be kept at room temperature overnight. Rewarm before serving.